Legislators have the opportunity to consider a bill this session that would license dental therapists in Kansas. Dental therapists are specially trained mid-level dental providers who would work as part of a dental team to provide routine and preventive care. There is strong interest in dental therapy among health, dental hygiene, education, safety net health clinics, aging services and other groups that want to find a safe and cost-effective solution to the state’s oral health shortage problems. In states that have licensed dental therapists, they work with general supervision of a dentist in dental offices and in community settings such as schools, Head Start centers, nursing homes and programs for individuals with disabilities, allowing the dentist to expand his or her practice and treat patients who otherwise face barriers to care. This model has been gaining traction over the past several years, particularly in places where there are large dental shortage areas. Alaska is one of those places. Minnesota is another. Maine and Vermont also have authorized dental therapists to practice. On the surface, Kansas may not look like Alaska or Maine, but in every part of our state, there are too many Kansans who can’t access dental care. Nearly 83 percent of Kansas counties don’t have enough dental providers to meet people’s needs. In metropolitan areas that attract more dentists, many limit the number of Medicaid patients they serve. Increasing access to oral health care for low-income children and medically underserved adults has been a priority of REACH since our establishment 13 years ago. The foundation has invested millions of dollars in programs to improve oral health, including funding school-based oral health screenings, fluoride varnish treatments, oral health prevention programs for pre-K students, a mobile dental unit, emergency dental funds and other initiatives. Still, thousands of low-income and uninsured Kansans go without care because there are not enough dentists to meet demand. In 2015, the Commission on Dental Accreditation (CODA) adopted accreditation standards for dental therapy education programs. The REACH Foundation began looking at the dental therapy model six years ago. Since that time, dental therapy has been studied and adopted in several states. In 2015, the Commission on Dental Accreditation (CODA) adopted accreditation standards for dental therapy education programs. CODA is recognized by the U.S. Department of Education as the sole agency to accredit dental and dental-related education programs at the post-secondary level – including the training of dentists. The CODA standards for dental therapy lay out a framework for education and training programs, including for Kansas. Dental therapists are highly trained mid-level oral health providers. In Kansas, dental therapists would be trained in programs that meet CODA standards and be required to pass the same clinical examinations as dentists within their more limited scope of practice. Dental therapists would always work at the discretion of a dentist and with general supervision. Dental therapists would make it more cost-effective for private dental practices to serve those with Medicaid coverage and enable safety net clinics that struggle to recruit enough dentists to serve more of their patients. In order to understand how this mid-level provider could help address our state’s oral health care shortages, I traveled to Minnesota, which has had dental therapy in place for five years, to visit practices that are employing dental therapists in Minneapolis and in rural Minnesota. A dentist who was leading one of those practices was employing four dental therapists and found those mid-level providers to be essential in serving vulnerable populations. 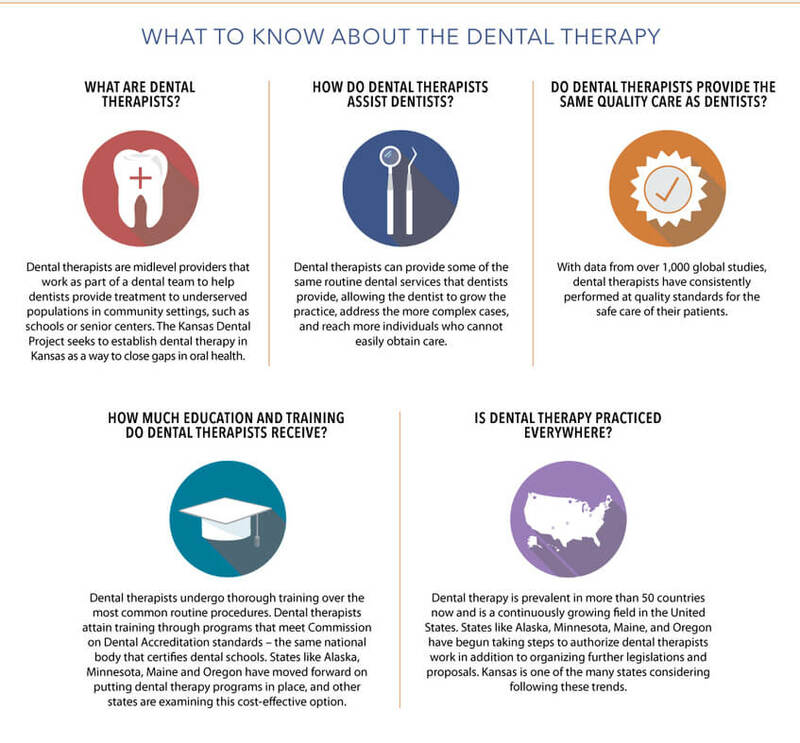 In Minnesota, dental hygienists who pursued the additional training said dental therapy offered them a way to grow as professionals and help meet health needs in their communities. The dentists I spoke with said that these individuals had enhanced their practice, allowing their team to operate more efficiently. REACH has helped to bring a couple of these dentists to Kansas to talk with dentists in our state. While they acknowledged the early skepticism among some of their professional colleagues, they talked about the practice advantages, the safety and how dental therapists complement their work. They reported that use of dental therapists had helped reduce wait times for appointments and increased access for patients on public assistance and for those with special needs. This week, I went to the Capitol in Topeka to listen to testimony provided by dentists and representatives of safety net health clinics. They discussed the importance of the CODA education standards, the opportunity to expand their dental practices and fully utilize their dental clinics and improve access in their communities, as well as create pathways for dental hygienists interested in continuing their education and professional growth to become dental therapists. In their testimony, they were passionate advocates for strengthening Kansas’ oral health care system and removing barriers to care. Through the foundation’s involvement with the Kansas Dental Project, our work with Kansas safety net clinics and our exploration of these programs around the country, we have come to see that dental therapy offers Kansas a safe and economical solution to this health access issue. Over the past couple of years, and again last week, I shared the foundation’s perspective in writing and encouraged our elected leaders to give full consideration to this workforce model. Information on dental therapy and the Kansas Dental Project is available online. And I’m pleased to share a link to the testimony provided this week. You can find the REACH Foundation’s testimony here.